The Rais Pilar wood stove encourages cosy moments in front of its large pane of glass that offers a fabulous view of seductive flames. 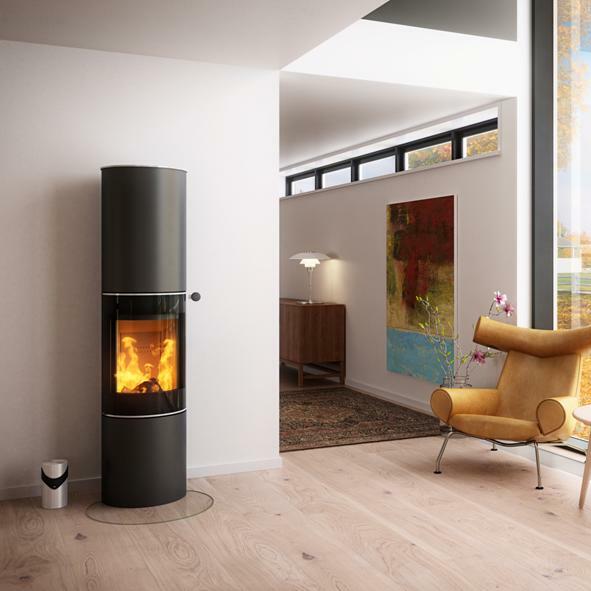 A tall and slim stove with a sophisticated design, the RAIS Pilar has an integrated turntable that allows the stove to be rotated up to 360 degrees. The Rais Pilar can be turned regardless of whether it is used with a top or rear exit. When using the rear exit, the flue collar can be turned from side to side and does not hinder the turntable function of the stove. With it's clean lines, it's a sleek and simple circular fireplace with a large curved glass door. This stove is rotatable to either 70°, 160° or 360° or alternatively it can remain fixed. Available in two heights and with top or rear outlet.